This entry was written by Claudine, posted on August 3, 2016 at 4:02 pm, filed under knitting, knitwear. Bookmark the permalink. Follow any comments here with the RSS feed for this post. Post a comment or leave a trackback: Trackback URL. Thanks! Actually, most of the reason that I did not use a pattern is that I don’t know how to read a knitting pattern, and don’t really have a desire to learn. If I concentrate until my brain starts to hurt, I can arrive at an understanding of a chart, but most patterns are written out, which is hard for me. This is so great, Claudine. Do you mind if I share the link to your blog on a Facebook group? Or would you be interested in joining our group? Miss Celie (Renee) belongs to the FB group, too. Thanks! Yes, by all means, share it everywhere! Thanks for allowing me to share. I agree with you about knitting patterns—charts are OK, but written instructions don’t compute with my brain! Gorgeous! That color is to die for, and it really looks like the most perfect fall sweater to just live in. How long did it take to kick out the pieces? Thanks! I love the color too. Just orange enough to feel like fall. Hmmm, hard to say. 2 weeks, maybe? But it would have been faster if I were more familiar with the process. You must be a savant! Gorgeous! Wow, incredible, I think you may just found a new hobby. It looks lovely. What a gorgeous sweater! And I LOVE the shaping. It gives it a feminine touch. This is gorgeous and I can just imagine how wonderful your dress will be! OMG THIS IS AMAZING!! (At first cap lock was accidentally on but then I realized this sweater deserves all caps). That is absolutely awesome. I’m definitely not the shape to wear something like this but as a vintage lover I can imagine what 1940s inspired gems you could produce! And with no pattern! I am so impressed. 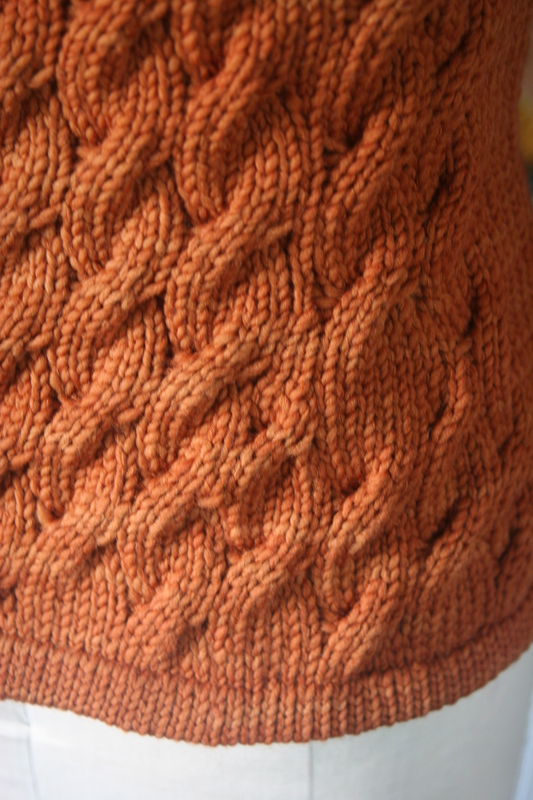 Never used a knitting machine, but it can’t have been easy to work out all that shaping and pattern at the same time. Brilliant. Totally amazing as a first machine made garment. I always agreed with you about not needing another hobby. However…..
Fabulous! Fellow machine knitter who didn’t need another hobby here too. Well done you. 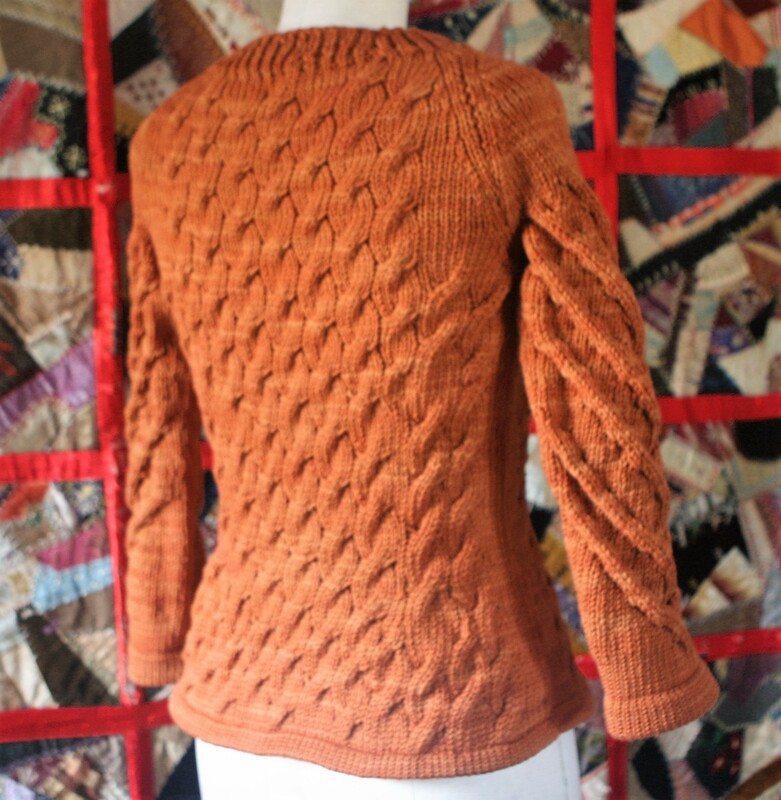 Also there’s lots of hand knit patterns now that are charted – in fact most new ones on Ravelry are now. With schematics, if you’re interested. Mostly knitted in the round tho. Thanks! I want to look into knitting in the round. I can do it with the ribber. I’m totally gobsmacked. Holy cow Claudine. I’m so glad you like / ‘get’ machine knitting!! I’m like you though. I’ve tried to read HK patterns and my eyes just glaze over. I’m much better with charts and diagrams. But, not like this. I KNEW you would take to this! You have the brain of an engineer and like to figure out puzzles. That’s totally what machine knitting is. And, with your machine and built in Intarsia, I think you’ll have multicolored unicorns on sweaters for your sweet girl in no time. I think the Singer Guide to Knitting Garments might be a good book for you if you’re going with the drafting route. 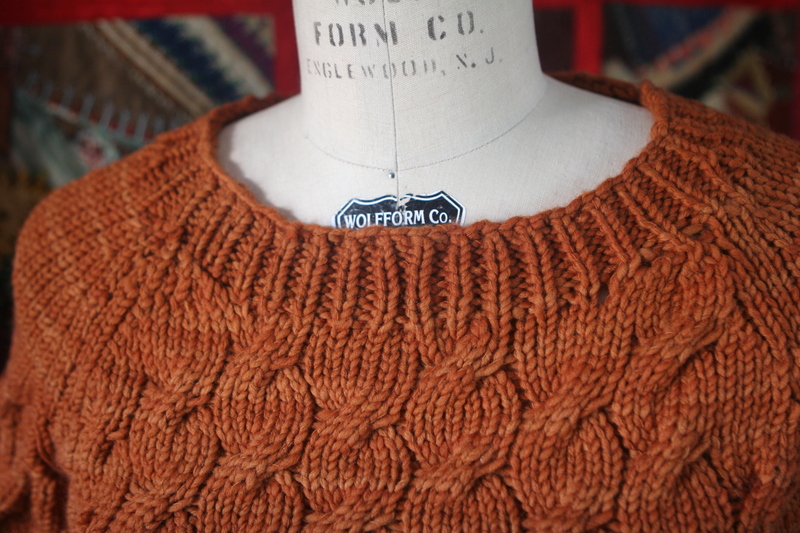 It shows ways to knit different kinds of collars, details, etc. 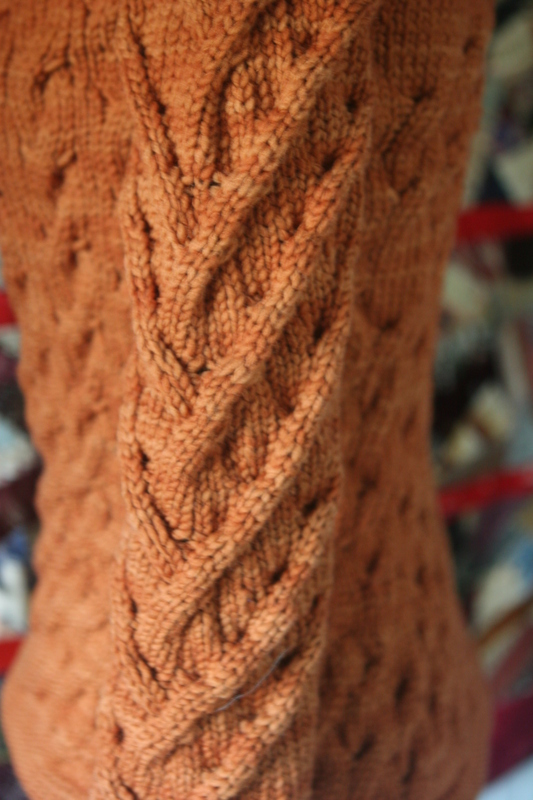 Did you use short rows for shaping? It’s so nice and smooth! And, that’s a hung hem, yes? Ok, I need to go and look at my machine in an accusatory manner. Thanks! You were so right about this hobby being a good fit for me. I totally need to look into the Intarsia. I used short rows on the sleeves, to get some elbow shaping. I think that’s the only place. Claudine, this is GORGEOUS! I watched it evolve on Instagram and was still amazed by the beautiful, professional result! this is amazing Claudine. I can’t believe that this is your first sweater! I am so tempted, but I keep saying I don’t need another hobby. But I am tempted! I have a friend who has two knitting machines she hasn’t used in years. Maybe I’ll ask her how much she wants for one of them. Thanks, Nancy! Technically, this is not my first sweater. I hand knit one a couple of years ago that I wear quite often. 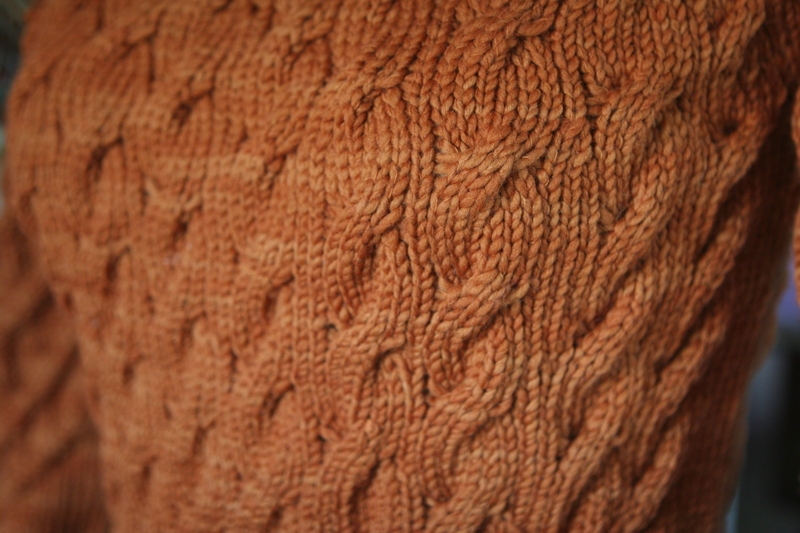 Then I started hand knitting another sweater, but never finished it. You’ve inspired me! I’ve had my knitting machines far too long and have only made hats. But I want a sweater! So I’d better get to it! Lovely! Yes, get to it! Even if you mess it up, you will learn so much that your next project will be perfect. Wow! That is one heck of a first project. Fabulous! Claudine, I shared your link with photo on two different groups. You’ve gotten 120 Likes and Loves with 17 comments on one group, and 42 Likes and Loves with 12 comments on the other smaller group. If you’d like to see the comments, I’ll copy and paste them into an email. Are you going to the Silk City sale this weekend? I haven’t seen a flyer on it yet. I emailed silk city a while back about their sales, and they told me that their next one is August 13. Unfortunately, I can’t make that date, but I plan on going to the September sale. I saw this on FB. It’s an awesome first effort that would defeat many more experienced knitters. I’m looking forward to more knitterly exploits from you! On the subject of knitting patterns, I wrote a blog post about my process to convert them into graphs that you can use at the machine. I started with a pattern that had a schematic drawing but you could also start with an existing sweater you like the shape of. I am most seriously annoyed with you. My muse has been trying to get me to buy a knitting machine and I have managed to ignore her. This post may have pushed me over the edge. Now I am off to troll the internet classifieds. Bad bad Claudine. PS-your sweater is beyond beautiful. Really lovely! Congratulations! And good for you not using a pattern. I always tell people that a machine knitting sweater pattern isn’t worth the effort. I never used them either. How do people ever get gauge? 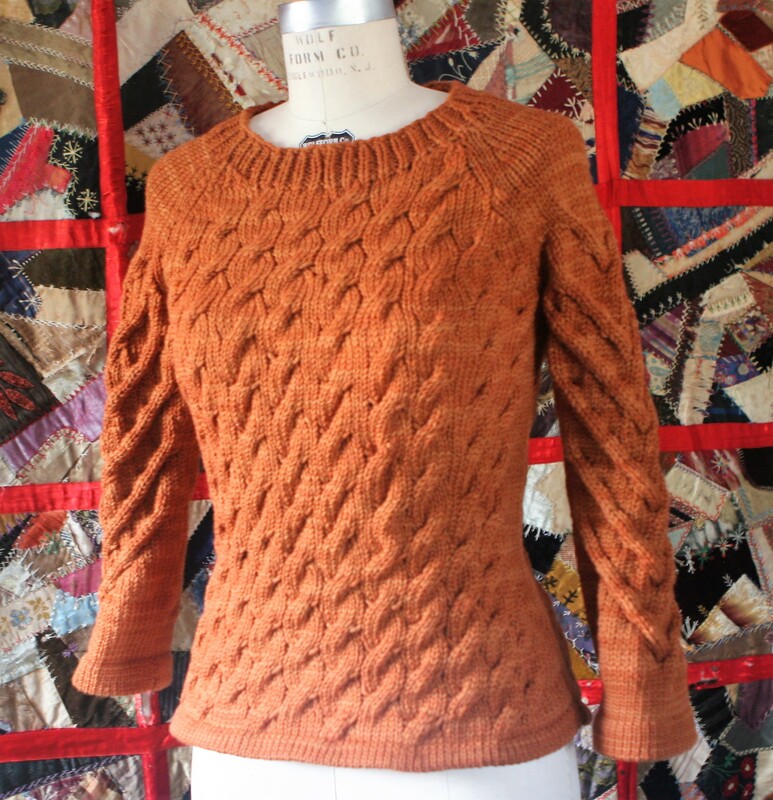 You’ve inspired me to do some fully fashioned sweaters again! So beautiful! Gorgeous. I am sooooo sorry that there is no pattern, because I was ready to buy it. But how wonderful that you figured one out to fit yourself. Congrats! Really nice work.